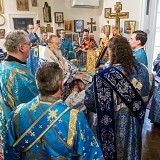 On Sunday, February 25, the feast of the Triumph of Orthodoxy, Divine Liturgy in the Synodal Cathedral of the Sign in New York City was celebrated by the First Hierarch of the Russian Church Abroad, Metropolitan Hilarion of Eastern America & New York, co-served by diocesan vicar Bishop Nicholas of Manhattan. On Saturday, February 24, the Great Lenten services were held at the Synodal Cathedral of the Sign in New York City. Hours were read and Divine Liturgy celebrated for the Saturday of the Holy Great-Martyr Theodore Tyro, officiated by Eastern American Diocesan vicar Bishop Nicholas of Manhattan, co-served by Synodal clergy. 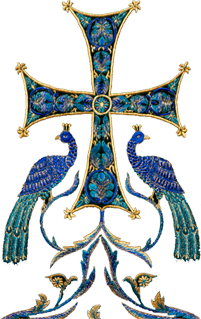 On Clean Thursday, February 22, after a difficult and lengthy illness, Prince Vladimir Kirillovich Galitzine reposed in the Lord. Prince Galitzine was a renowned dignitary in the life of the Church and Russian-American society, and for over 40 years served the Holy Church in his position as warden of the Synodal Cathedral of the Sign in New York City. On Forgiveness Sunday, February 18, Metropolitan Hilarion of Eastern America & New York, First Hierarch of the Russian Church Abroad, celebrated Divine Liturgy in the Synodal Cathedral of the Sign in New York City. Concelebrating with His Eminence were Eastern American Diocesan vicar Bishop Nicholas of Manhattan and Synodal clergy. On Friday, February 16, the feast of Holy Hierarch Nicholas of Japan, the Heavenly patron of Eastern American Diocesan vicar Bishop Nicholas of Manhattan, a moleben to the Enlightener of Japan was served in the Synodal Cathedral of the Sign in New York City. 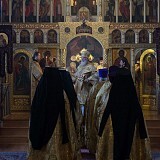 On Thursday, February 15, the great feast of the Meeting of the Lord, Metropolitan Hilarion of Eastern America & New York celebrated Divine Liturgy in the Synodal Cathedral of the Sign in New York City.At the service, Metropolitan Hilarion ordained longtime Reader and Subdeacon Pavel Roudenko to the diaconate. On Wednesday the 14th and Thursday the 15th of February, the great feast of the Meeting of the Lord, Eastern American Diocesan vicar Bishop Nicholas of Manhattan visited Holy Presentation Church in Stratford, CT, and led the divine services for the parish’s patronal feast day. 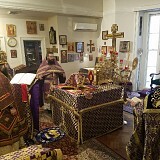 On Sunday the 11th and Tuesday the 12th of February, the feast of the Three Great Hierarchs – Basil the Great, Gregory the Theologian, and John Chrysostom – Metropolitan Hilarion of Eastern America & New York visited Holy Trinity Monastery in Jordanville, NY, where he led the divine services. 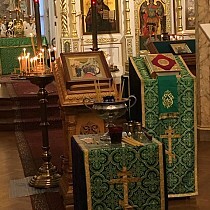 On Wednesday, February 7, the feast of the Holy Hierarch Gregory the Theologian, Archbishop of Constantinople, and Holy Hieromartyr Vladimir, Metropolitan of Kiev & Galicia, His Eminence Metropolitan Hilarion of Eastern America & New York, First Hierarch of the Russian Church Abroad, celebrated Divine Liturgy in the Church of Our Lady "Unexpected Joy" on Staten Island, NY. On Sunday, February 4, the feast of the New Martyrs & Confessors of Russia, His Eminence Hilarion, Metropolitan of Eastern America & New York, First Hierarch of the Russian Church Abroad, visited Holy New Martyrs Church in Brooklyn to lead the patronal feast day. On Sunday, January 28, the First Hierarch of the Russian Church Abroad, Metropolitan Hilarion of Eastern America & New York, visited St. John the Forerunner Cathedral in Brooklyn, NY, and celebrated Divine Liturgy. This was Metropolitan Hilarion’s first divine service in the United States after concluding an archpastoral visit to the Diocese of Australia & New Zealand. As a result, a multitude of worshippers came that day to pray together with their archpastor.